Enter your email address to subscribe to this blog and receive notifications of new posts by email. If you do you'll be officially amazing! This is a really quick post about the horrible earthquake that just occurred in Japan. It’s shocking to me that our world is going through such terrifying times. Just think in January last year Haiti had their earthquake. Granted Japan is a wealthy country with much more ability to look after their people but it is still a terrible tragedy for a country to suffer. If you’re like me you can’t jet off to Japan to help the people who are suffering but there is a couple of things we can do for Japan. Firstly we can pray. We can pray that as many people as possible not only survive but receive all the help they need from the Japanese government and external organizations. The second thing we can do is a pretty great project I found out about called ‘Paper Cranes for Japan’. It is being organized by http://www.DoSomething.org which is a great movement for youth in the US to make a real difference. In response to the massive earthquake and devastating resulting tsunami that hit Japan earlier today, DoSomething.org is appealing to us—the young people across the United States—to share our love and support for the Japanese people with Paper Cranes for Japan. 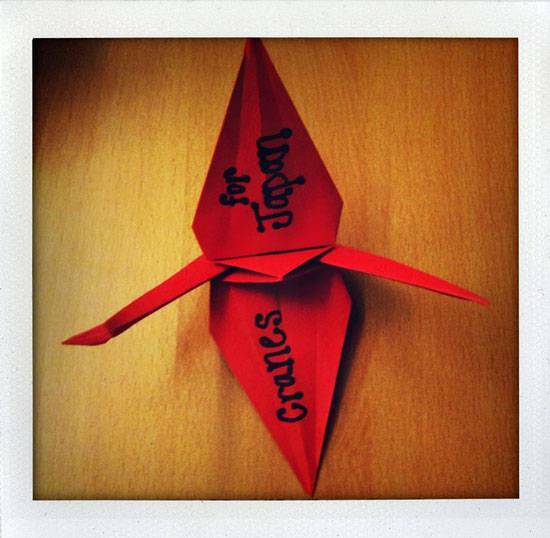 Upload that photo along with a message of support to the Facebook page Paper Cranes for Japan. Why cranes? Cranes are sacred creatures in Japanese culture. According to ancient legend, anyone who folds a thousand origami cranes will be granted a wish—like long life or recovery from illness—by a crane. Do Something is aiming to collect 100,000 photos of origami cranes from young people to represent 100 wishes for relief and healing to all who affected by this tragic natural disaster. It’s as simple as Fold, upload. Fold, upload. Fold, upload. I think this is a great idea that can really show a lot of support to the japanese youth that will inspire them to help their community in such a dark time. Please consider Paper Cranes for Japan and you can upload to Do Something’s facebook right here – Join. Outside of the Paper Cranes please, please pray for the Japanese people, you’d be surprised what prayers can do. I experienced the second worst hurricane season in Florida on record and that was bad enough. I can’t imagine being in such a disaster as an earthquake and tsunami. My heart and prayer goes out to the Japanese people, I hope yours do too.